Series of muggings: Inside jobs? If you take a stroll on a Sunday morning near a bank, you will see a large number of people queued up at the banks. Most of them are staff of huge businesses who are at the bank to deposit their employer's hard cash. Yusuf from a local company climbed into his company's van intending to deposit the cash earned by the company during the last three day of the week at the bank. The bag containing millions was in his hand. The moment he opened the van door to exit the vehicle outside the bank, he faced one of the most terrifying moments in his ten years working in the Maldives. Two masked men came up to him and grabbed the precious bag, placing a knife at Yusuf's throat. In just a moment, the two men fled with the bag of money on a motorbike. Doesn't this incident raise suspicions? How did the robbers know the vehicle would arrive at the exact location at that exact time? How did they know the person inside had a bag full of money? Was this the only van carrying money among all other vans traveling the same road? During the past two months, incidents of mugging and robbery on the streets have increased significantly. This same period has posed the threat of snatching on the road for businessmen and locals alike. There are lots of questionable aspects to these incidents. Since the beginning of the year, several incidents of "organized crime" has taken place in Male. While the political uproars quietened down following the 2018 presidential elections, the threat and danger posed by crimes in the community unfortunately did not diminish. A new chapter of pre-planned, organized crime has started. Suddenly, carrying large amounts of money on the roads have become doubly risky. Muggers are spreading fear, with the civilians venturing outside hesitantly. Depositing money at the bank has reached a new level of dangerous. Not even shopkeepers feel safe sitting in shops with drawers full of cash. Since January 2019, six noteworthy incidents of mugging have taken place i the greater Male' region. While two of these incidents took place in reclaimed suburbs Hulhumale', the rest of the incidents took place in Male'. All six incidents had one thing in common: all incidents took place under very similar circumstance, in a very similar way. Therefore, it is safe to assume that these incidents were "inside jobs" where the crime is committed by or with the assistance of a person who know the details of the cash movement, most likely an employee of the company. Just this week, MVR two million being transported from state fish company MIFCO was snatched in broad day light while en-route to the airport. Th incident occurred on the newly upgraded Boduthakurufaanu Magu on the outskirts of town. Just a day before the incident, the media had reported that the flourish in fishing industry has prompted MIFCO to send payments to fisherman. The incident occurred during the afternoon of the next day after these reports began circulating.The police are now investigating the case. The van used to transport the cash by MIFCO is not exclusively used for transporting cash. The vehicle usually carries canned tuna. If this is the case, how did the robbers come to know that the vehicle would be carrying millions on that fated day? How would they know to prepare themselves, dressed in the appropriate gear to conceal themselves and execute the robbery, stopping a moving van and smashing its windows with an axe? We all know the monotonous answer that will be given by the police for these questions. "We are investigating the case", they would say. The police have already given this answer regarding the MIFCO robbery. However, the whole community is raising questions and suspicions, coming up with theories of their own on how the robberies may have been strategized. Although MIFCO did not reveal a lot of information regarding the incident, we have come to know through different sources that three people were inside the van at the time of the robbery. This is in addition to the "security" staff who usually accompanies employees when large amounts of cash are transported. The vehicle departed from the MIFCO head office near the stadium in Maafannu ward. The robbery took place a mere three minutes later, on the outer road near Villa College. Four men riding on two motorbikes cunningly and strategically attacked the van from behind. They were decked out in helmets, jackets, ankle and elbow guards - appropriately dressed for such an 'occasion', no doubt. The moving vehicle was attacked with the passenger on one of the motorbikes smashing the driver-side window of the vehicle with an axe. While the driver was still recovering from the shock, the windshield was smashed, the force of which broke the door on the driver side of the vehicle. It was after this point that the muggers opened the door of the vehicle to extract the money bag. How did the robbers know to prepare so well, how did they know to tailgate the vehicle closely after it was loaded with the money? There is no chance for us to assume that the robbers were not aware of the cash movement prior to the mugging. All signs point to the fact that the robbery was most definitely pre-planned. Let's take a look at daylight snatching that has taken place since January. MVR 250,000 was snatched in Hulhumale' from FSM Pvt Ltd in January, while MVR 300,000 of ROOT shop in Hulhumale' was snatched the same month. 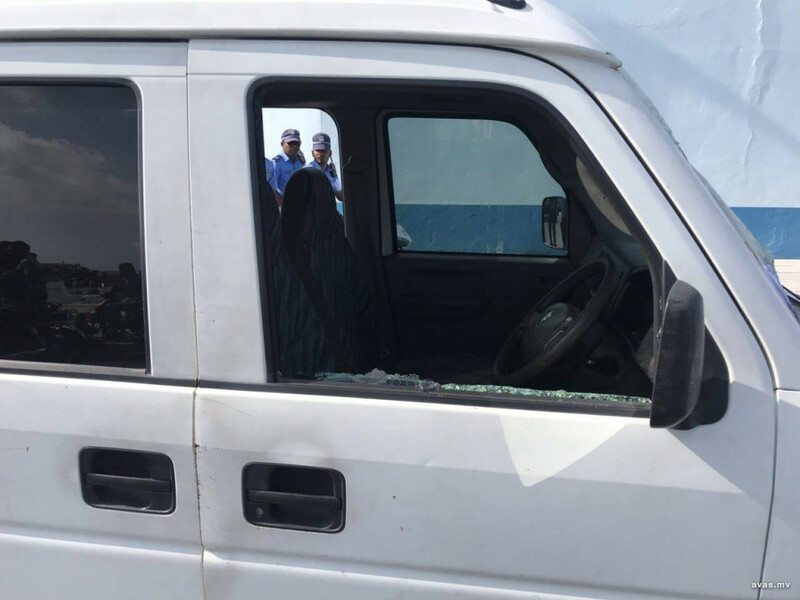 MVR 150,000 and a cheque worth MVR 160,000 were snatched from Horizon Fisheries Pvt Ltd, and robbers threatened and snatched MVR 560,000 from Expert Motors shop in capital Male. MVR 2.3 million that was about to be deposited to the bank by BHM shop was snatched, and now MVR 2 million has been stolen from MIFCO. If we sum up these amounts, it would easily exceed MVR six million in loss caused to local businesses. Earlier this month, helmets were made mandatory to be used when crossing the Sinamale' bridge and the highway connecting it to Hulhumale'. While the helmets are intended to keep one safe on the road, the same helmets are now being misused to conceal the identities of muggers out on the streets. While incidents of mugging has increased to a dangerous level, is it not time for local businesses to invest in private security hire in moving cash? The police already offer security for such movements, why aren't businesses utilizing the service? While it is clear that there are plots involved in executing these robberies, is it not time to admit this?